Just tremendous! 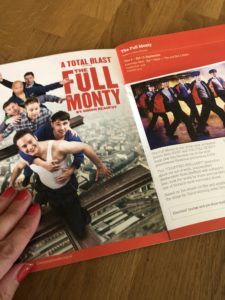 That’s my verdict of The Full Monty play, which has taken The Everyman Theatre Cheltenham by storm in the opening run of its last ever UK tour. I literally could not breathe with the sheer energy of the performance and after the final few exhilarating seconds of ‘The Full Monty’ itself, I don’t think I will ever be able to breathe properly again! Adapted for the stage by the Oscar winning writer Simon Beaufoy, this “chuffing brilliant” production of the smash hit film is about six out of work steelworkers from Sheffield who decide to create their own male strip tease act in order to solve their money problems. 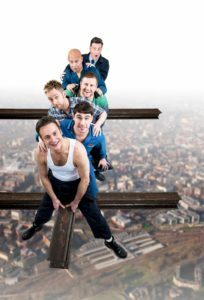 As the guys prepare for their performance, there are lots of ups and downs in what is essentially a comedy but which also cleverly touches on a range of real issues such as unemployment, homosexuality, debt and suicide. However, this is to be no ordinary strip show as to get their audience, the guys set out to go one better than the Chippendales by making their show ‘The Full Monty’! The gorgeous Gary Lucy leads an all star cast as the down on his luck Gaz with Andrew Dunn as the hapless Gerald, Louis Emerick as the not so well endowed Horse, Joe Gill as the despondent Lomper, Kai Owen as the overweight Dave and James Redmond as the three legged Guy. A standing ovation speaks for itself as testament to the sheer genius of this production and the quality of all performances. Featuring the feel good music of Tom Jones, Hot Chocolate and James Brown, you’ll be tapping your feet in your seats, dancing in the aisles and cheering from the sides as the down on their luck guys capture your hearts and souls in an unforgettable rollercoaster ride of laughter and emotion. This is one show you do not want to miss! If you’re quick you might be able to grab the last remaining tickets for this weekend’s final performances at The Everyman Cheltenham or you can keep your hat on for longer with The Full Monty as it makes its way around the UK on its final 2018/2019 Tour. With the departure of heartwarming The Full Monty, spine-chilling darkness is coming next to Cheltenham. But are you brave enough to enter the terrifying palace of Dracula and his three brides? You can win 2 tickets to opening night of the brand new stage adaption of Dracula which debuts at The Everyman Theatre on Friday 28th September by clicking on this link! Entries close on Friday 21st September! Please note that this is not a sponsored post but I was invited to see the production as press.